Fiber Flux: Free Crochet Pattern...Moonflower Cowl! The Moonflower Cowl is the perfect cowl to take you from winter to spring. 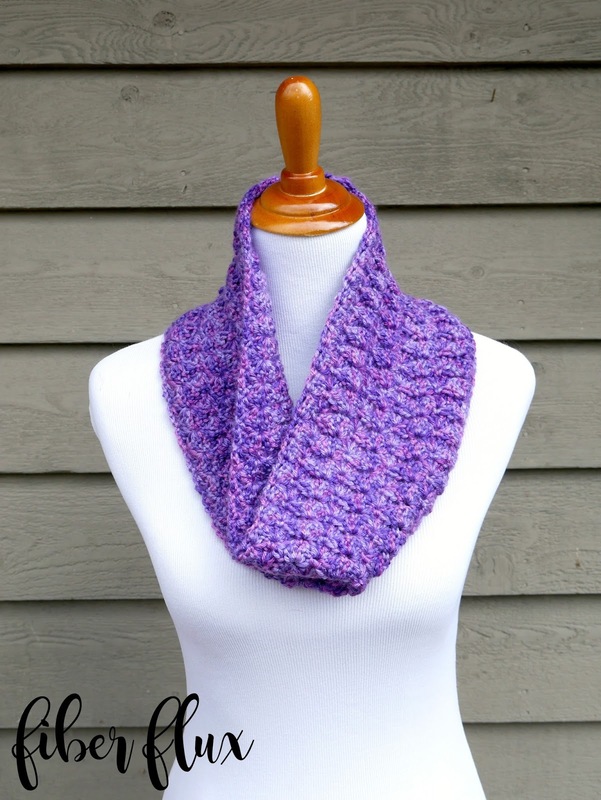 Crocheted in gorgeous tonal yarn, it is worked up in an easy fan stitch. 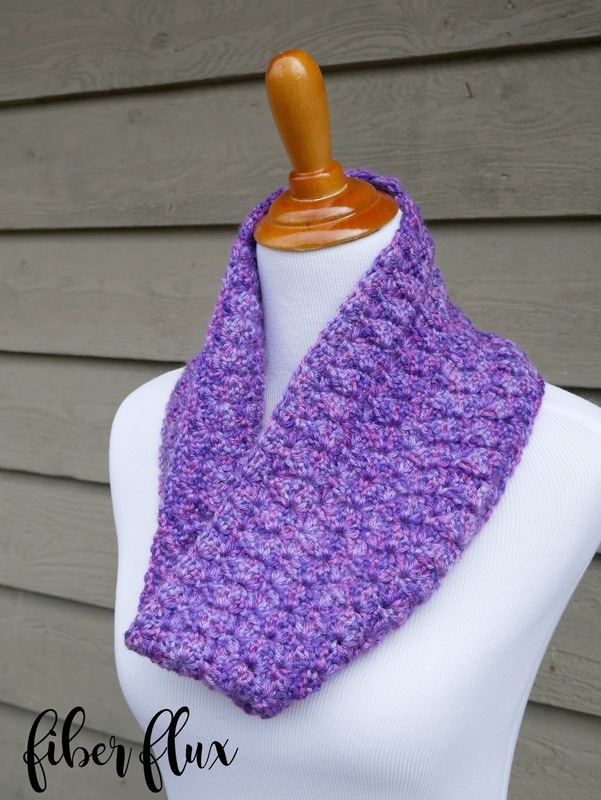 This is a one-skein project, making it perfect for on the go crochet too! 1 ball of Red Heart Soft in "Plummy"
Learn more about Red Heart Soft Yarn here! Round/Row 1: In the 4th ch from the hook, work 2 dc. *Skip two ch then work a sc in the next ch. skip 2 ch and in the next ch, work 4 dc. Repeat from * until there are 3 ch left on the row. Skip the next two ch, and in the very last ch, work a sc. Round/Row 2: Ch 3 and turn. Work 2 dc in the sc from the previous row. *Work a sc in the center space of the fan from the previous row (area in between the posts right in the center). Work 4 dc in the sc in between the next two fans. Repeat from * to the end of the row. Work a sc in the turning chain space to finish the row. Repeat row 2 until the piece is approximately 30 inches long. 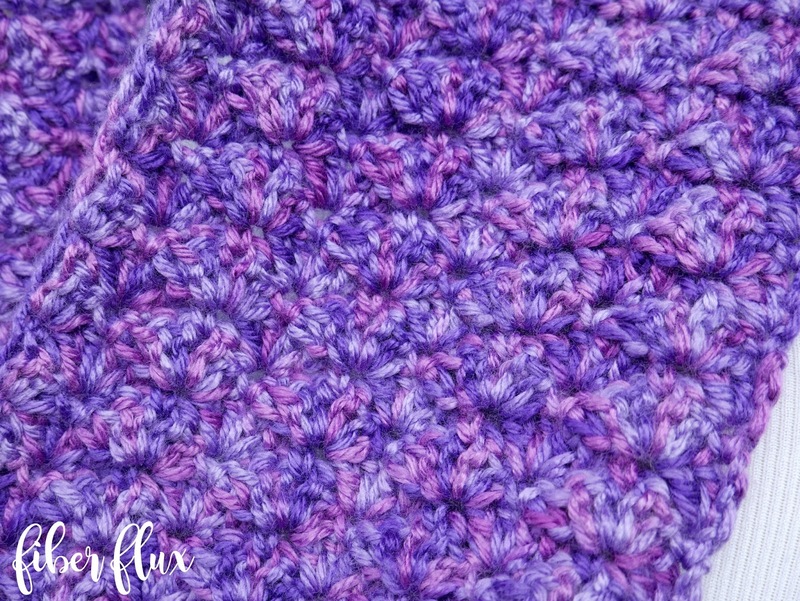 Be sure to save about 18-24 inches of yarn to work the seam (see below). Do not fasten off and sandwich the two ends together. Work a slip stitch seam into both layers all the way across (see the video if you need to see the seam worked + a few tips too). Love your simple but awesome patterns... Have subscribed to ur vlogs on youtube, and these happy vdos and pretty colors inspire me to create something equally vibrant. I agree with Rashmi! This would even be nice in the spring if made with a lightweight yarn! Thank you for sharing!